The events that took place in Japan last Friday are still fresh in everyone's mind. Videos, photos, and stories from residents in these affected areas continue to come across the news channels, giving us a deeper picture into the devastating affects that these events have had on the people of Japan. Len Chamberlain, Geomagic's Sales Director for Americas, Asia and Strategic Partnerships, was in Tokyo last Friday, and shares his story of what it was like to be in the city that day. We are relieved to have him back, and to hear that Geomagic's staff, their families and our partners in Japan are safe, but still keep everyone in our thoughts as we move into a new week. The Red Cross continues to ask for donations to assist those affected by this tragedy. Please consider donating to this cause if you have not already made a contribution- the people of Japan truly need our help. I started feeling queasy almost immediately after I checked-in to the hotel. The Park Hotel Tokyo in Shiodome is a magnificent high-rise, the lobby is located on the 25th floor and the rooms go upward from there. As I lay in bed after the long day of travel I can feel the room sway, but I so exhausted I figure I'm just jet-lagged. The next morning, which always starts bright and early for me in Asia (3:30AM in this case) I was sure it was not jet lag causing the room to sway. Jet-lag very rarely causes creaking sounds in my room. I looked out the window and was almost immediately sea-sick. Not vomiting or anything, just that out-of-sorts feeling you have when what your body feels, doesn't match what you see. Headed down to breakfast in the lobby and casually asked the waiter if they had any stationary rooms I could move to. (Sarcasm never works in Japan, but that hasn't yet stopped me from trying.) The waiter reassured me that mild earthquakes were part of life in Tokyo. And it is true that it is actually fairly typical for me to feel some type of movement every time I've been there. Usually very slight, but perceptible. I figured the tall hotel was just amplifying the sensation. We, my Japanese colleagues Rumiko Ariyoshi, Daishin Ikenoue and myself, proceeded with a great week, meeting with some of our key hardware and distribution partners in the area. The meetings went really well. The economy in the area appears to be making a comeback and people are cautiously optimistic about the future. However, the small tremors never stop. So much so, that I actually go to the USGS website to look for the seismic activity in the area. Whoa Nelly! There had been earthquakes nearly every hour since I'd arrived. They were centered northeast of the city in the Pacific Ocean. Most of them were in the 5.0 range but a few were over 6 and a one over 7 in magnitude. Thinking back on the week I could match the times listed on the website to my swaying hotel room. If the earthquake was over 6, I would definitely feel it. After about 3 minutes the major shaking stopped, but the building continued to rock back and forth for awhile. We went back into the conference room and turned on the TV to see what had happened. This event had the same epicenter as the previous quakes on USGS, just much larger. Tsunami warnings went out. We sat (or in Rumi's case - kneeled) transfixed and watched the TV as aftershocks continued to rock the building. We walked into the office (attached to the conference room) to find book shelves and computer equipment all on the floor. There were families to be checked and ways home to find. The Tokyo train system shuts down automatically in cases like this. It would be a few days before the tracks could be checked and normal service resumed. Where I live in Denver, stopping train service is a very minor inconvenience for people. Tokyo runs on rails. When we reached street level, after the obligatory kissing of the ground, I found out just how important the trains systems were. We had no way to return to our hotel. Taxis had been snapped-up almost instantly, huge lines for very few busses. We started the 90 minute walk back to our hotel. We had a lot of company on the street. People were amazingly calm. I was convinced I would see several buildings had been toppled, but I saw only minor damage, windows and brickwork on the entire walk back. When we got back to the hotel, they were not allowing visitors upstairs. So we did the only logical thing under the circumstance - headed to the nearest bar. In the bar the images from the Tsunami and the devastation of towns North of Tokyo were horrifying. Luckily all immediate families were safe. It took some time to determine this, as mobile networks were predictably jammed. From the bar we spotted a few people walking up the stairs in our building so we made our way back. Ike-san had another hour to go for his walk home. Rumi and I began the long climb to our rooms. The hotel was very calm and believe it or not I slept like a baby. I figured if the hotel was still standing after an 8.9 magnitude quake - the odds of a larger one happening that evening was very small. I don't think Rumi felt the same way but we were lucky to have a place to stay. Nearly 4 million people pass through Shinjuku station every day. (and that is just one of the big stations in Tokyo.) Now all of those people had nowhere to go. So many people were stranded on the street that night that convenience stores were stripped bare of food by sunset and fast food restaurants sold-out shortly after. All-in-all Tokyo had survived the event amazingly well. Had the same quake struck another area I am certain the death-toll would have been orders of magnitude higher. Next time you meet a Japanese civil engineer, please give them my heartfelt appreciation. 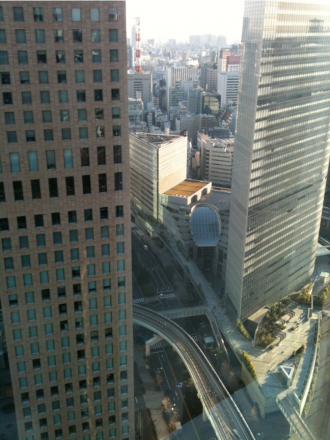 The buildings in Tokyo are amazing. The next morning I was watching the devastation on the TV and packing to leave. I wasn't sure, but had heard the Narita was at least semi-operational. Calling the airline and they reassured me the flight would be departing on schedule. The only trick would be getting to Narita. I asked the front desk and they very politely told me it would be impossible to get to the airport today. People in Japan are so nice, that you say"OK - Arigato!" when you get that sort of news from them. However, as I was walking away I realized that the highways are closed and the trains are stopped. There probably IS no way to Narita. I was just about to book another night in the hotel when Ike-san called. He was willing to try and drive me to the airport. I wasn't going to say no to that offer. Turns out that getting his car out of his parking garage would not be easy. Cars were now well out of their usual spaces, but Ike did arrive at my hotel as promised. We headed for Narita. It was complete gridlock. After making it 2km in one hour on some of Tokyo's side streets we decided on another plan. A few of the local subway lines were open. By transferring multiple times it might be possible to get to Narita by rail. I've been to Japan many times now, but the subway is still a mystery to me. Especially today, when some lines will run and others wouldn't I was very grateful to have a guide. Ike-san stayed with me for the 3.5 hours it took to get me on a train that would eventually go to Narita. There were three or four transfers involved and we were packed like sardines for much of the ride. But I made it to the airport and I am forever grateful to my colleague for giving-up his entire Saturday to get me there. Hopefully I'll think of a way to repay the favor someday. I landed in Seattle to connect to Denver. On the TV I saw the explosion at the nuclear plant in Fukushima. I feel a stab of deep sadness in my stomach. It will take a long time for certain areas of Japan to recover. It is a strange feeling -- you see so much suffering and you feel guilty for being able to go home. So many people there have nowhere to go. I have never experienced more kindness and grace in the face of adversity than I have this week. 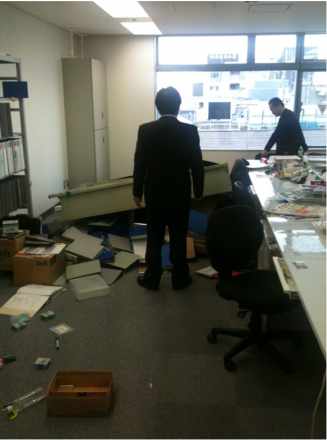 I will be looking for ways to help my customers, colleagues and the people of Japan put the pieces back together. I am confident they will, and I look forward to my next visit.